Breeding habitat: Open areas, forest edges, and mountains near large lakes and rivers. Requires tall trees for nesting. Winter habitat: Coastal areas, large inland lakes or rivers with some ice-free water. Diet: Fish (staple); birds, especially waterfowl; mammals such as rabbits and muskrats; carrion; occasionally, turtles and shellfish. The Bald Eagle's nest is usually located near a body of water with an abundant supply of fish - typically the ocean, a large lake, or large river. Each year, this raptor adds to its nest and, over many years, it can eventually weigh as much as a record two tons! It may even become so heavy that it causes the tree where it is located to fall. 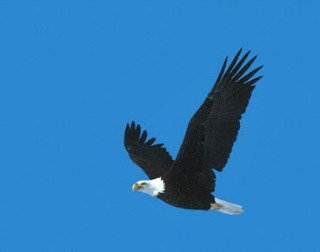 The Bald Eagle, often found in the same habitat as the Osprey, frequently steals fish from this bird. The eagle waits for the Osprey to catch its prey, then follows behind, harassing the Osprey until it drops the fish, which the eagle then catches in midair. 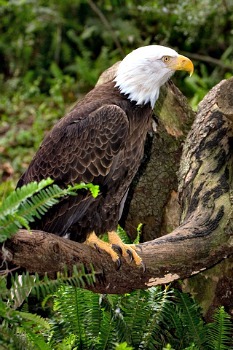 The life span of this eagle in the wild is between 20 and 30 years. In captivity, they have been known to live as long as 48 years.